First, let this be a reminder to always watch your step when boarding a train. Second, never forget how awesome your fellow human beings can be. ABC News Australia (h/t Digg) posted the following video to YouTube, showing a commuter who accidentally falls through the opening between train and the ledge at Stirling station. 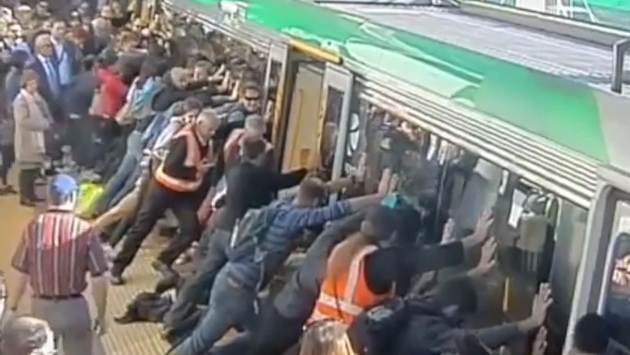 Rather than wait, fellow commuters band together to shove the train just far enough to free their fellow traveler, giving us yet another video that should see heavy run on the Internet. The Associated Press has more on the incident that occurred Wednesday in Perth, Australia. According to the report, a passenger noticed the man who fell between the door and ledge and immediately alerted officials to hold the train. As of this writing we couldn’t track down any information on the man saved by fellow passengers, but we have to assume he was just a wee bit frazzled the second he found himself stuck next to a train that has a schedule to keep. Essentially, this would have been the moment we would have freaked out and used every last expletive ever learned, possibly in multiple languages. Fortunately, officials had a solution and asked those who weren’t stuck between a train and a hard place to push with all their might, leading to quite the closed-circuit television finale. This story isn’t quite done, because the report states the unidentified man was doing well and caught the next train, which is far more than we might have done. We can safely say a similar issue would see us swear off trains altogether. However, if you do decide to get wedged in a very unfortunate place, make sure there are teems of do-gooders at the ready nearby.